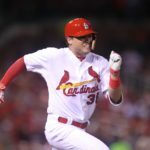 Cardinals rookie shortstop Aledmys Diaz grew up on the same street as Jose Fernandez when they were kids. 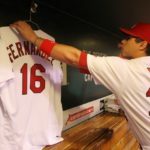 The last few days have been especially difficult for Diaz and after returning from a memorial service for the Marlins pitcher who died Sunday in a boating accident, he honored his friend on the field with a grand slam in Tuesday night’s win. Diaz says that is just the beginning. Diaz sent a 2-1 pitch from Cincinnati starter Robert Stephenson over the left-field wall that traveled 408-foot drive. It turned a 2-1 into a 5-2 lead. 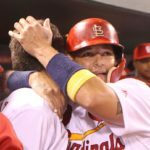 It not only woke up the offense, but brought a flood of emotions for Diaz. Diaz said it was special to hit that grand slam, the first of his career. Diaz says he plans to continue to honor Fernandez.